The CEO of Gerber Collision’s parent company reported Thursday that the company’s normalized same-store sales jumped 5.2 percent in the fourth quarter of 2018. For a little context, CCC reported that collision and liability claims were down 0.9 percent in the fourth quarter and only up 0.1 percent for all of 2018, according to LKQ’s CEO. Asked about the impressive growth, Boyd Group CEO Brock Bulbuck said the demand for collision work remained strong, just as it did in the third quarter of 2018. “We have strong demand for our services,” he said on an earnings call. But Bulbuck indicated a major factor was also the company’s progress on its technician shortage. The company has a backlog of work that simply can’t be converted to sales if it lacks the techs to do the repair and get paid. “We’re not out of the woods” on the tech shortage, but the Boyd Group made enough progress to post the kind of results it did in the fourth quarter, according to Bulbuck. Gerber’s success here should be a competitive consideration for shops struggling with their own technician shortage: Dramatic action might be necessary, particularly with rivals like the MSO upping their compensation. But it also provides a glimpse of the kind of reward that such workforce investments could bring — the chance to capture sales that technician-strapped competitors would have to backlog or decline. You might not need to be a national MSO to pull this off, either. SCRS right now is working with HR services firm Decisely on an opportunity for members to band together on association plans and collectively get a better deal on health and retirement benefits than they’d get as individual small business owners. The trade group has said it hoped to have the 401(k) option for members sometime in the April-June quarter. Asked by an analyst for a breakdown of same-store sales growth by technician productivity and technician count, Bulbuck declined to reveal the information. “We did add sufficient technicians” to increase growth, he replied. However, he said the amount of unprocessed work still remained high at the end of the year, the opportunity uncaptured because of too few technicians. Bulbuck said the unprocessed work was at “relatively stable levels” relative to the third quarter of 2018. It wasn’t meaningfully up or down, he said. The company’s business strategy of dealership intake centers also has been curtailed by the technician shortage, Bulbuck indicated. He called those facilities — storefronts funneling work to Gerber’s real collision shops, delivering a benefit to both a dealership and Gerber — “another very good tool” for organic same-store sales growth. However, he said there was no point to adding one if the company had too few techs to capitalize upon it. The tech shortage also might keep Boyd from reaping the benefits of what had been for some areas a nasty winter, Bulbuck said. Asked about measuring the impact of the benefits enhancement, Bulbuck said the company monitors turnover and same-store technician count. He said that as he thought Boyd reported in the third quarter, the company made “modest, very modest” improvement in turnover. It also increased same-store technician count. “I think we’re on a journey,” Bulbuck said. He didn’t think the workforce issue was one that could be measured on its anniversary. Enhanced benefits wouldn’t solve all the company’s tech issues, and Boyd would need to continue to work on recruiting and development, according to Bulbuck. He indicated a formalized apprentice program to grow Boyd’s own techs was now standardized across all markets. 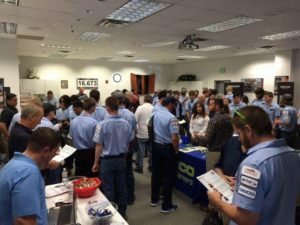 A 2018 Boyd newsletter described an 18-month Gerber Technician Development Program to train 100 techs annually launched that year. It was in three states as of May, and Boyd planned to bring it to Canada too. “We have many, many people initiatives that we’re working on,” Bulbuck said. It would be a “slow and gradual process” of improvement, he said.